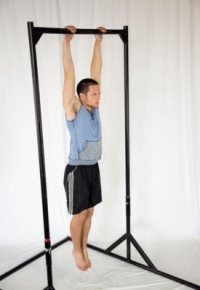 The hanging knee raise works the entire abdominal wall — the upper, the middle, and the lower. It’s easy on the back and really helps develop the strength needed to complete a full hanging leg raise. For this movement, you need something to hang off of. A pull-up bar is the obvious first choice, but a set of gymnastic rings or any other sort of hanging device will work well. 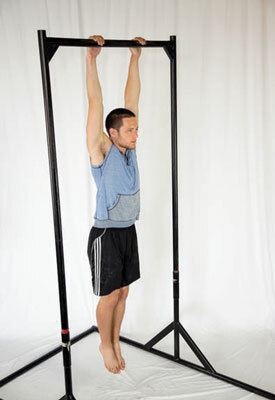 1Assume a dead hang position from a pull-up bar or rings. Brace your abs and flatten the arch out of your back — think about trying to mimic the hollow position from the V-up. Try not to use any momentum when performing the hanging knee raise — that means no swinging or kipping! Keep space between your shoulders and your ears while hanging. 2Slowly raise your knees up toward your chest, but don’t lean back. Instead, try to keep your torso as vertical as possible throughout the entire movement. This step is often what makes the hanging knee raise and hanging leg raise so difficult but so effective for strengthening the abs. 3Slowly lower your knees all the way back down and repeat. 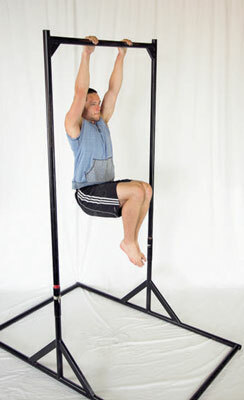 At the top of the hanging knee raise, your shoulders should still be positioned close to your ears. If they’ve gotten too far away, you’re probably leaning back too much.